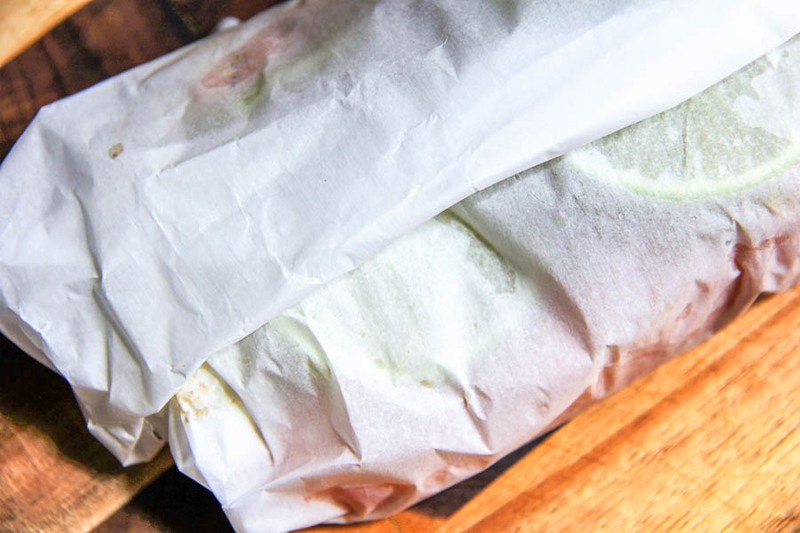 I love fish baked in parchment paper. So easy & no dishes! 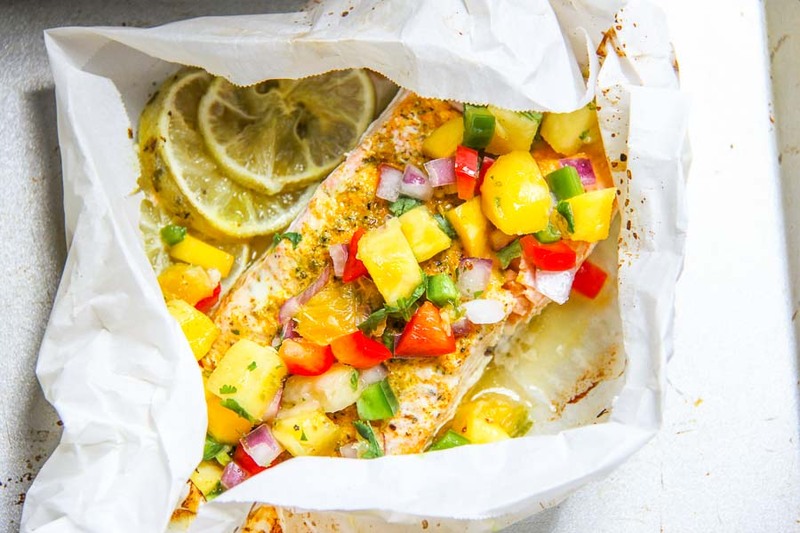 Just a single fillet of fish, seasoned as you wish, with a little bit of tequila (save some to make this margarita) and wrapped up in a pouch of parchment to steam the fish into flaky perfection. Not only is it really healthy, super quick, and clean up is a breeze, but everyone can get in the kitchen and make their own pouch. Our Cuban Spiced Salmon with Tropical Salsa is a festive version of a classic method. 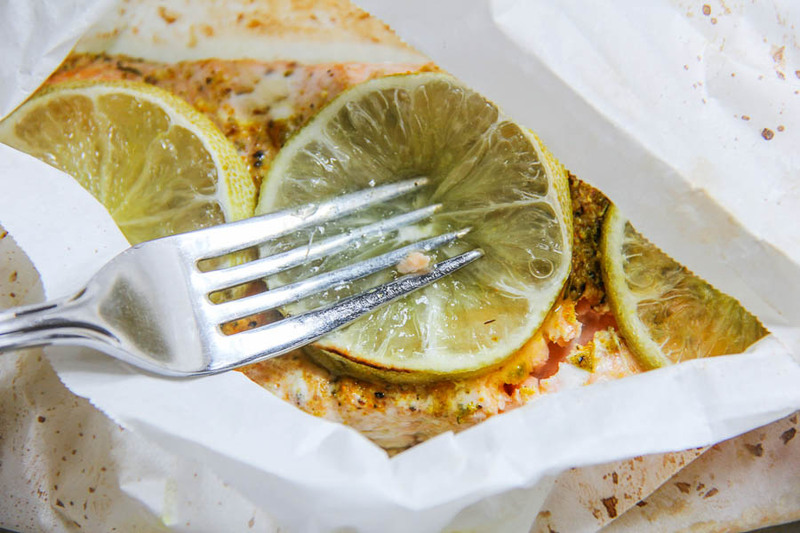 The classic method is called “En Papillote” and is often done with salmon (see more salmon recipes here) or a thick, white, flaky fish. It simply means fish cooked in a paper pouch. What a great way to get the kids in the kitchen or have fun with your dinner guests! Everyone can make their own fish packet. Best of all, your family can season it how they like, add whatever veggies they want, and even sign their name on the packet before it goes in the oven. When the fish is done cooking, don’t unwrap it. Just place the pouch directly on their plate and let them open their little present of YUM. 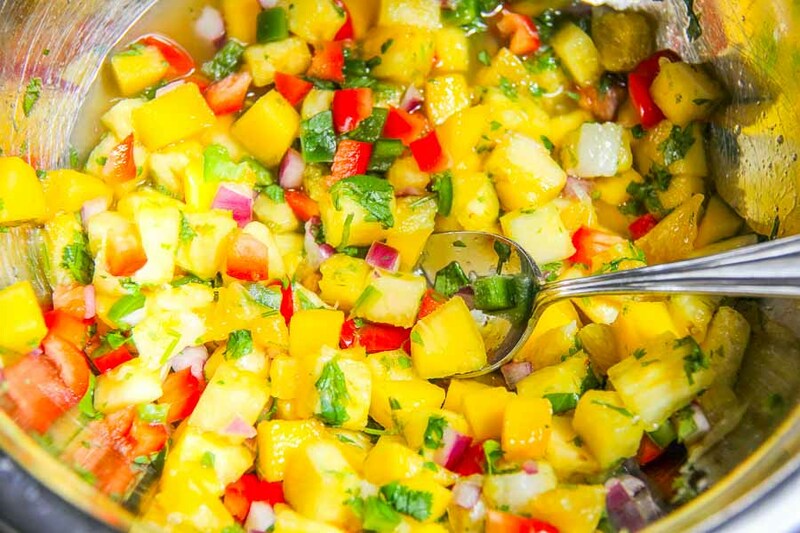 Pass a bowl of our amazing Tropical Salsa to top the salmon and your dinner routine has gone from drab to fab! Best of all, I’ll show you how to make a mason jar of my Cuban spice mix that you can use for chicken, pork, and shrimp. It’s delicious and takes just a minute to make with ingredients you already have on hand. Season up the fish, top with lime slices and a bit of tequila and wrap the fish in parchment like a package. Next, fold the paper down to create a seal then twist and tuck the edges to make a package that has some room for the steam to build. They’re super easy and don’t have to be perfect. 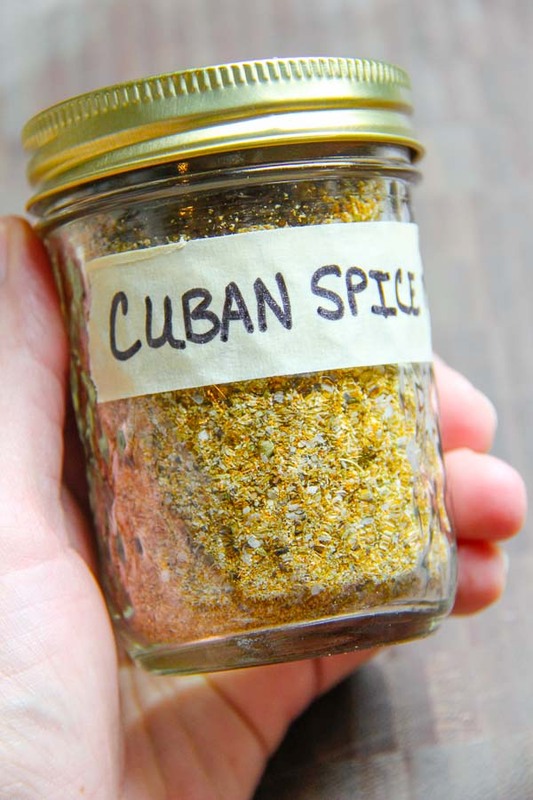 First, mix up your own Cuban spice mix with items from your own spice cubbard. It’s amazing on shrimp, chicken and pork too! 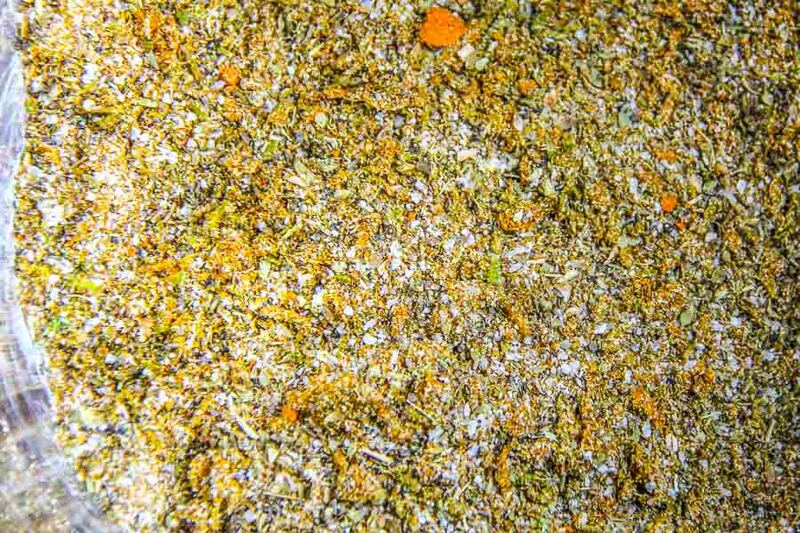 If you don’t want to make your own, this store bought spice blend is a great substitution. Get organized! 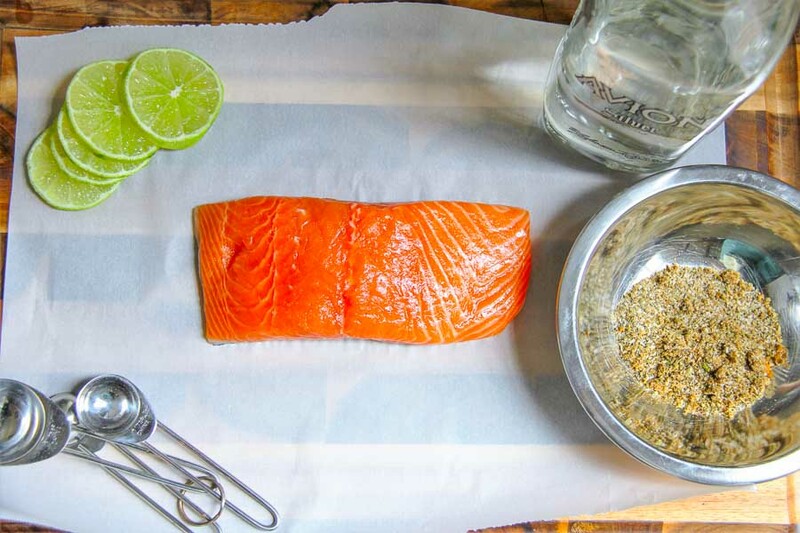 Lay out your ingredients for Cuban Spiced Salmon onto a board and cut some parchment paper about 15-18″ from the roll. To keep things moving quickly, set up a stack of parchement sheets to make a pouch making station. 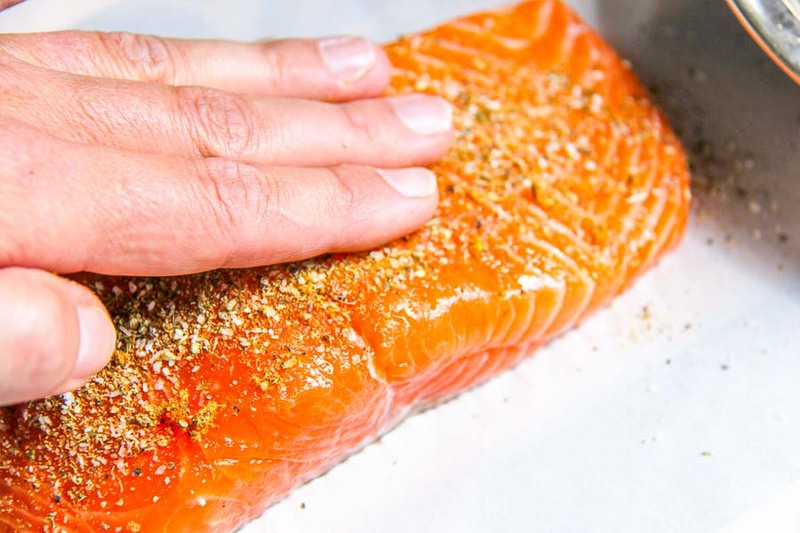 With your hands, season the salmon with the spice mix you made. 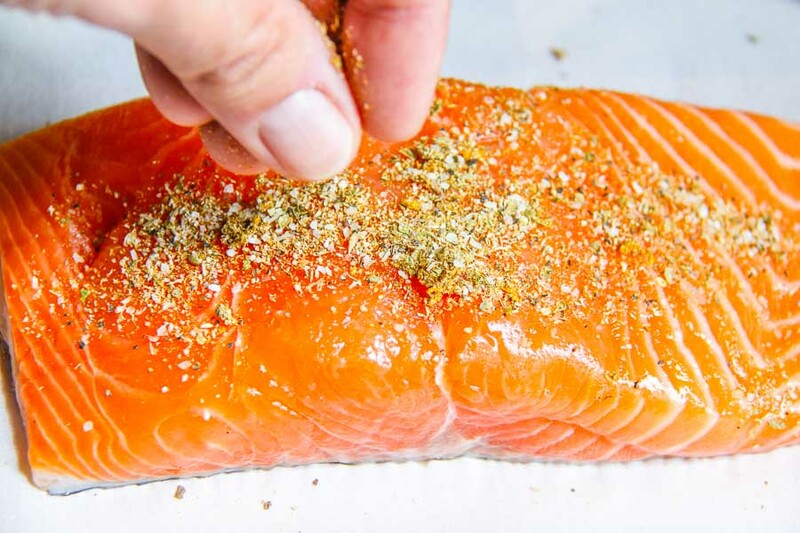 Make sure to pat the seasoning into the salmon and make sure you have plenty on the fillet. 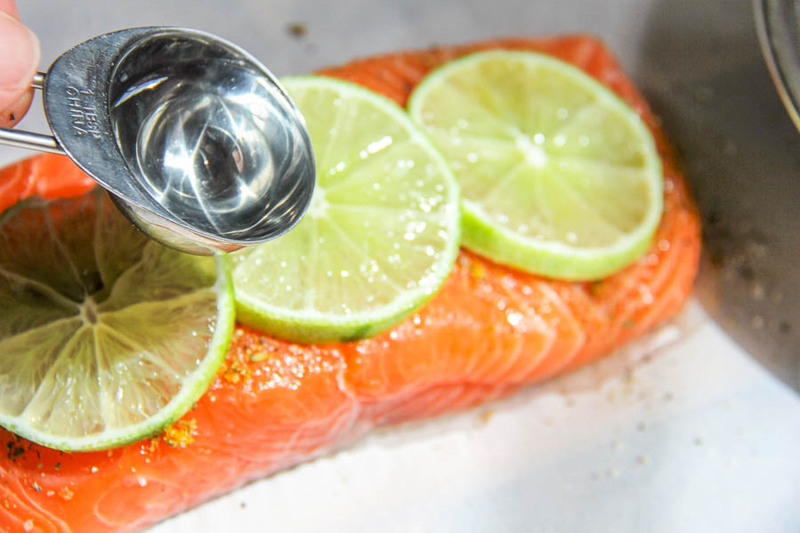 We often don’t season our food enough and since the salmon will be steaming itself in the pouch, it won’t get any flavor from the cooking method (like it would with pan searing or grilling). 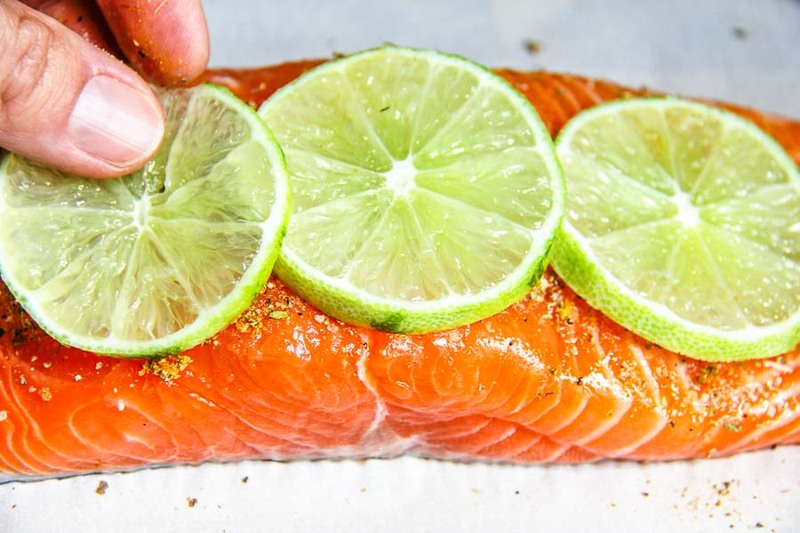 The next step is to lay thin slices of lime onto the salmon fillet. Since I use the same lime I zested before to make the Cuban Spice Mix, there’s no waste! 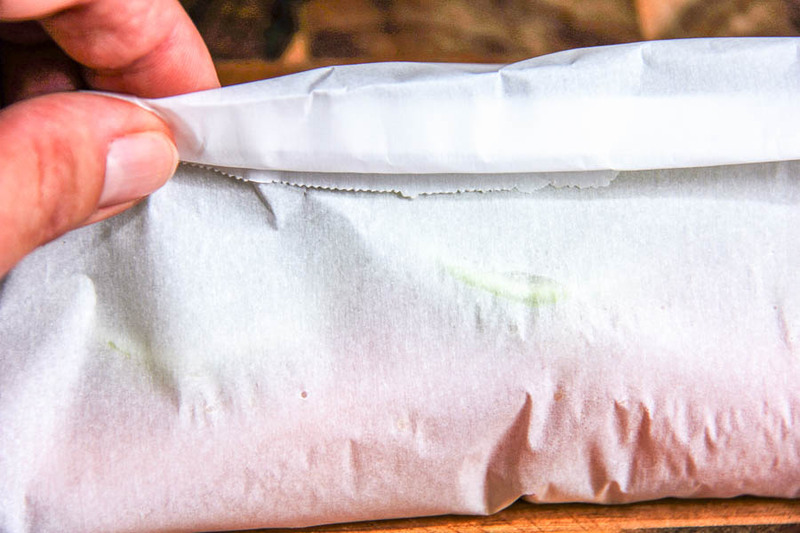 In order to keep some moisture in the pouch, drizzle some Tequila onto the top. I always have a good quality but reasonably priced tequila on hand like this one. If you don’t want to use alcohol (though the alcohol completely cooks off and is perfectly safe for the whole family), just use lime juice. 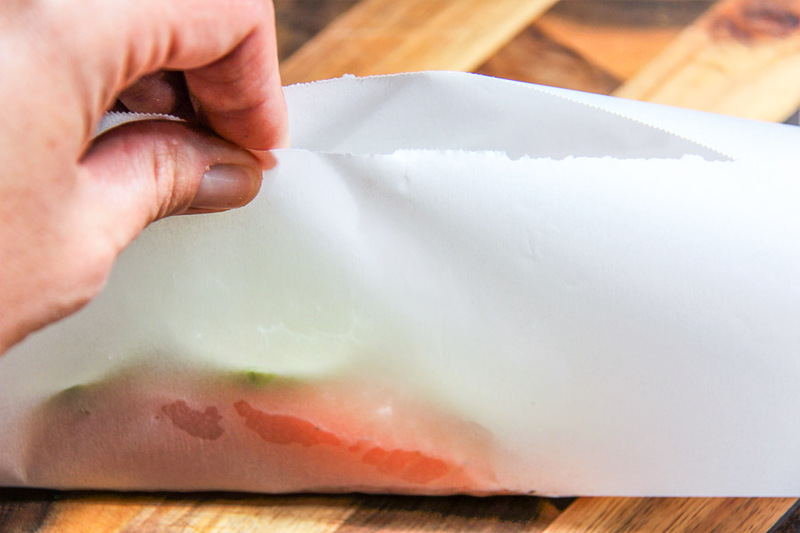 Once the Cuban Spiced Salmon is prepped, seal it in the parchment paper pouch. To make the pouch, first pull sides of the paper up lengthwise. Next, fold the sides of the paper down a few times to seal the packet. Then, twist the short ends tightly. While you still have twisted wings to grab hold of, pick up the packet and move onto a sheet pan. Tuck the twisted ends under the main body of the packet. Pop these babies in the oven! 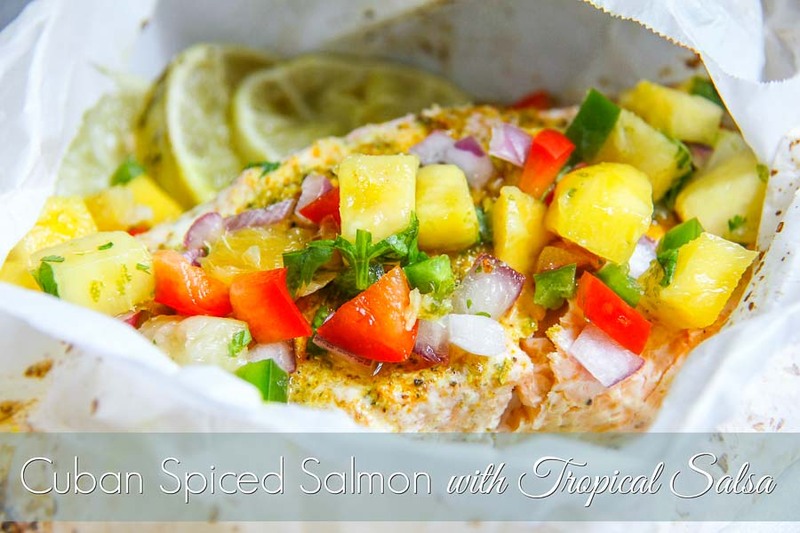 While your Cuban Spiced Salmon packets bake, whip up a delicious tropical salsa to top the salmon. When the pouches are done roasting, place them straight onto the plate. Open the pouch and press the roasted lime slices with a fork to release the amazing juices. This is my favorite part! It makes the dish come alive! Everytime I teach this recipe at an appearance we all hold our fork in the air and do it together. It’s that important! This dish takes your dinner routine from drab to fab! It's a great way to get the kids in the kitchen or have fun with your dinner guests. In a medium size bowl toss ingredients together. In a small bowl mix ingredients together and store in a mason jar. On a sheet of parchment paper (about 18” by 12”), place fish. Season with Cuban spice mix. Top each fillet with 3-4 lime slices and 2 tbs tequila. 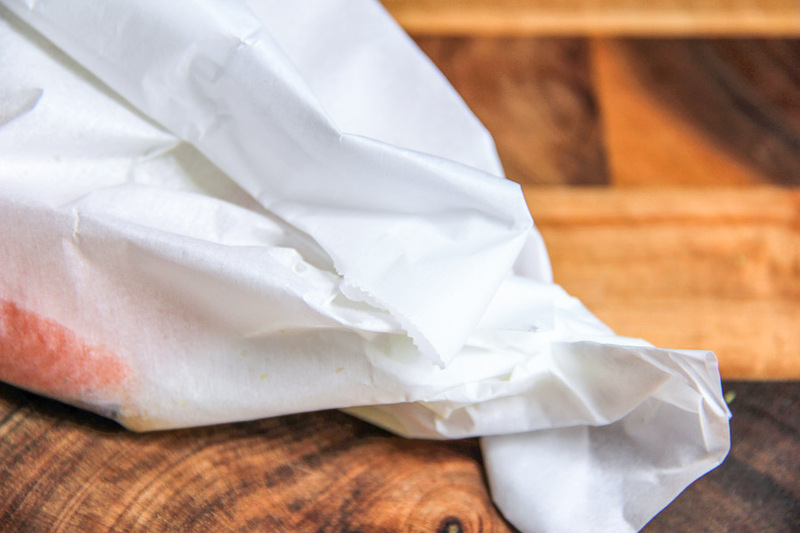 Pull sides of paper up until they meet and fold down together, leaving a bit of room for paper to puff during cooking (1-2”). Twist side edges and tuck under paper, placing on a sheet pan lined with parchment. Bake for 15-20 minutes, depending on thickness of fish. Serve with fresh salsa on the side.